I don't know if you can call my situation a true reinvention, because I'm really just expanding an enterprise I've been doing on the side for 15 years. 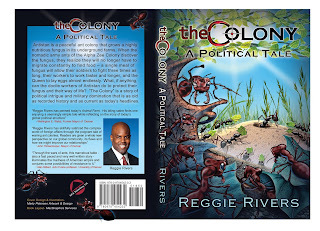 I'm focusing full-time on promoting my self-published book, "The Colony: A Political Tale." It's an allegory about foreign policy told through two colonies of ants, and it is my fifth published book. I recently earned a Master's Degree in Global Studies and I wrote this allegory as my thesis. I knew two months in advance that my contract at CBS4 would not be renewed, and my wife wanted me to spend the time contacting other news directors about potential openings. But I knew that stations everywhere were cutting back, and as an experienced self-publisher, I wanted to concentrate on this new book. So the past three and a half months (two before I was laid off and one and a half since) have been filled with the effort of getting the cover designed, interior pages laid out, finding a distributor, promoting the concept on Facebook and Twitter and visiting book stores asking them to carry the book. Only time will tell if "The Colony" will be successful and the effort I've put into it will yield a livable income. But I'm encouraged by the fact that just three days after I announced on Facebook that I was taking pre-orders at www.reggierivers.com , I've already sold 46 books. People are paying for a novel that they won't receive for more than a month! It's remarkable, and it speaks to the power of social media, because 80 percent of these sales have come through Facebook (the other 20 percent are family members). Hopefully, sales will be even stronger when the books arrive from the printer, and readers can actually see and feel the item that they're purchasing. This really is excellent info discovered right here. I like your site. Many thanks greatly for that reveal. Right now click here check cashing Maintain publishing.